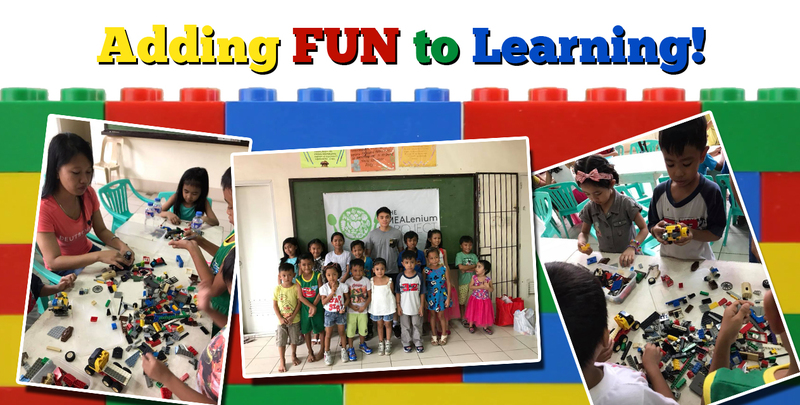 More kids in Payatas are flocking to the study hall in St. Benedict built by The MEALenium Project because of their new teaching tool – Lego. This idea was conceptualized by The MEALenium Project founder Philip Sebastian “Basti” Belmonte. He thought of gathering the old Lego bricks and figures of his friends so that the children who uses their study hall can use it to learn and play. Lego has been proven to be a visual tool in improving the English and Math skills of school children. (Source: http://www.teachingideas.co.uk/maths/ways-to-use-lego-in-the-classroom) Studies have shown that even simple Lego bricks can improve simple calculation skills such as addition, subtraction, multiplication, division, and even fractions. It can even be a visual aide in memorizing multiplication tables, with each peg in the Lego brick serving as one count. The bricks can also be used to build letters and words, which help in word building and recognition. Figures and other toys also help in students’ storytelling skills, as well as idea and story creation. The volunteer tutors have noted that the students are fond of creating robots, cars, houses, which they create stories with. The study hall in St. Benedict, Payatas has been opened since August 2017. The hall can sit up to 30 children and it is equipped with books from different subjects, ranging from Math, Science, and English. A computer with internet access is also available for the children for research purposes. A lot of school kids from Grades 3 to 6 visit the hall on Saturdays since it provides an alternative place to study, compared to their usual cramped houses that doesn’t have chairs, tables, or even functional lighting fixtures. Since the introduction of Lego in learning and playing, more kids were encouraged to visit the study hall. One of these students is JJ Sabado, 9 years old, who looks forward to going to the study hall every weekend. “I am excited to learn using Lego. I am happy when I am playing with it. Every Saturday, I borrow the Lego bricks and toys here in the study hall,” he said. The study hall is part of the efforts of The MEALenium Project to give the children of Payatas a chance to rise above their poverty by giving them a safe, comfortable, and well-lit space to study. The main initiative of The MEALenium Project is the daily feeding of school children in Payatas with nutritious meals so they don’t have to worry about having no “baon” and they can attend the school with ease. Healthy meals are prepared by the mothers of the students, who also learn about budgeting and nutrition.